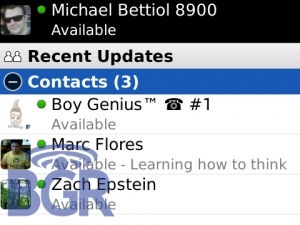 BlackBerry Messenger coming to OS 5.0 devices | BlackBerry Blast! BGR has been giving the world the exclusive news about the upcoming BlackBerry Messenger. The new Messenger service will be available on all OS 5.0 devices. In addition to loads of screencaps BGR has posted the following list of features for the BB Messegner. SMS support — You wanted threaded SMS? Well you’re finally going to be getting it! PIN barcode scanning — Too lazy to add your friend to Messenger by entering in their PIN? Just have them click the Barcode option on their devices and, you guessed it, a barcode will show up letting the other party scan it with their BlackBerry camera and immediately add that contact to your list.